Listed below are the locations of Memorials dedicated to the fallen of our Regiment. 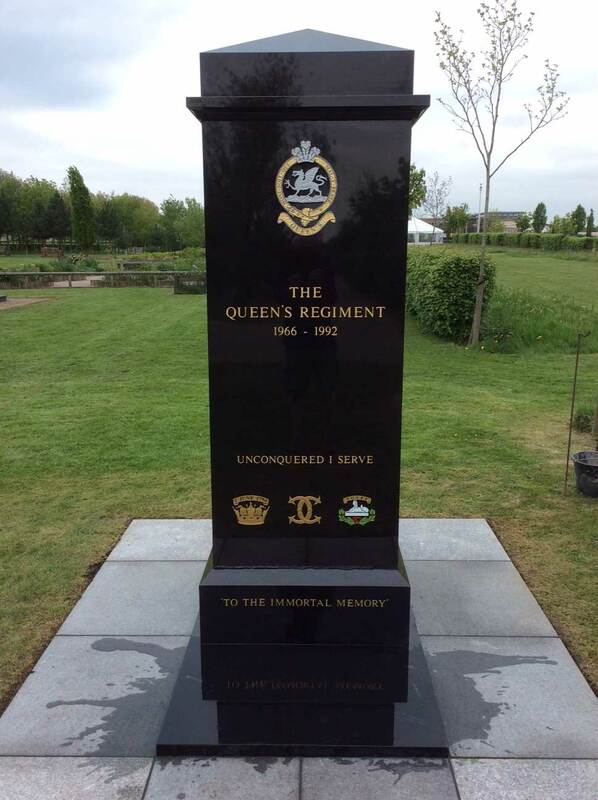 The Dedication of The Queen's Regiment Memorial took place at the National Memorial Arboretum on 15 May 2016. The Memorial was unveiled by Captain Harrie Welmer, Defence and Naval Attache to the Embassy of the Kingdom of the Netherlands. The Memorial Wall is dedicated to all who served in The Queen’s Regiment, particularly those who died as a result of terrorist action. The central royal cypher originally sat above the entrance to the Officers' Mess, Wemyss and Infantry Barracks, Canterbury and was later displayed in the original Queen's Regimental Museum before being incorporated into this memorial. 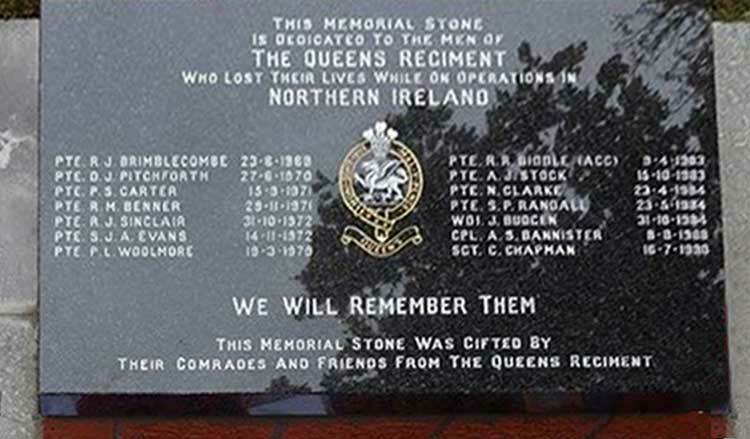 First dedicated on Sobraon Day, 10 February 1995 by Ven Peter Mallett and unveiled on 10th February 1995 by Maj Gen Fergus Ling, the inscription on the memorial reads "To all who served in the Queen’s Regiment especially the following who died through terrorist action in Northern Ireland and England". It stood outside the Regimental Headquarters at Howe Barracks, until its closure in February 2015 when it was moved. 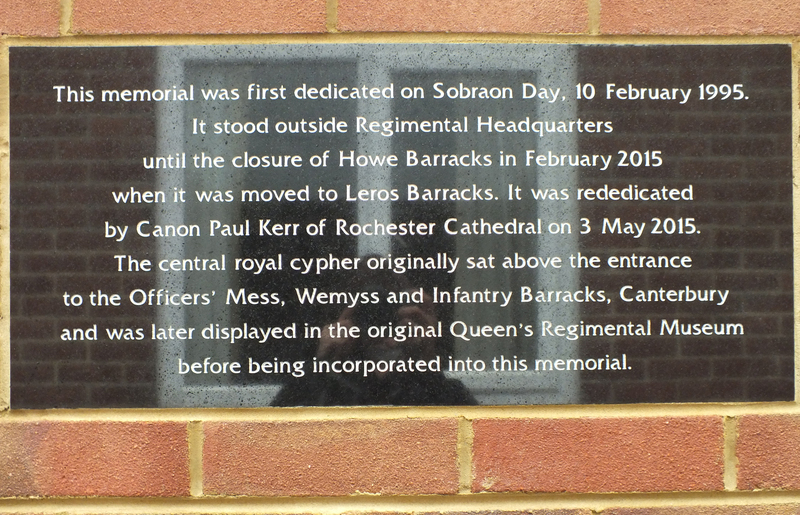 On 3 May 2015, It was rededicated at a ceremony in Leros Barracks, by Canon Paul Kerr of Rochester Cathedral. 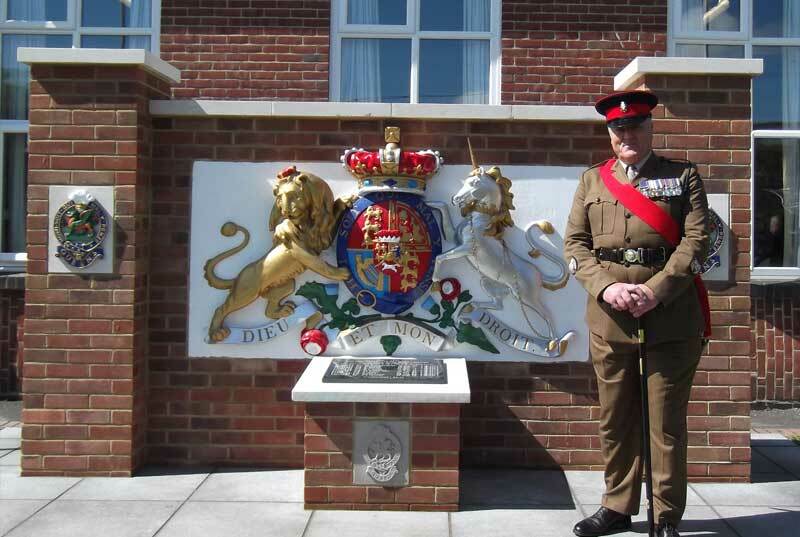 The dedication of a memorial plaque in Palace Barracks - October 2014. The organisers were Graham McDonough and Tony Baker. This memorial plaque was funded through private subscription with donations from members of all Battalions. 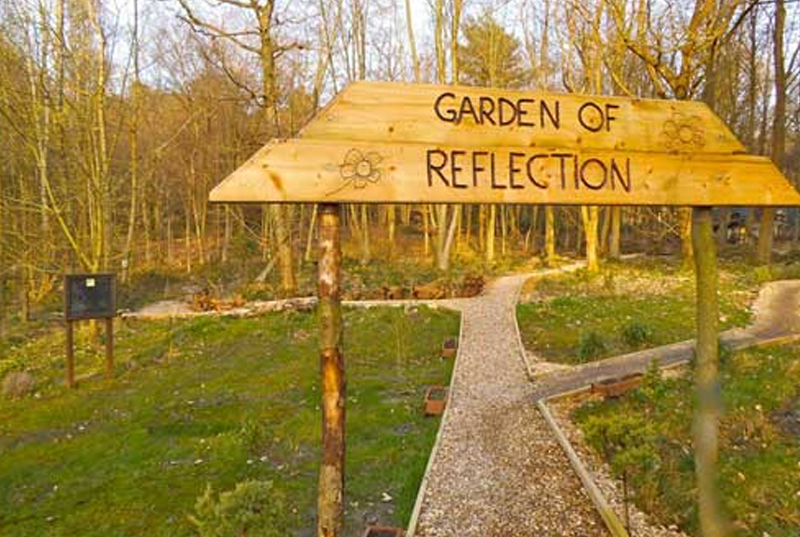 You will find trees of remembrance, memorial plaques and quiet seating areas. This window was commissioned following a decision by CO Lt Col Paddy Panton, that in addition to commemorating the Omagh tour, it would also be dedicated to Pte Biddle of the ACC who lost his life whilst attached to the 1st Battalion. Money was raised by a number of members of the Battalion, who ran the Belfast Marathon in1983. Upon the closure of Lisanelly Barracks, the Regiment, along with the family, agreed that the window would go to the ACC Depot in Worthy Down near Winchester where it would be preserved and Pte Biddle would be honoured.